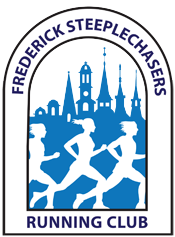 The long-time Frederick Steeplechaser walked-on to the power-house University of Maryland track team where, in 1963, he ran 800 meters in 1:51.8. 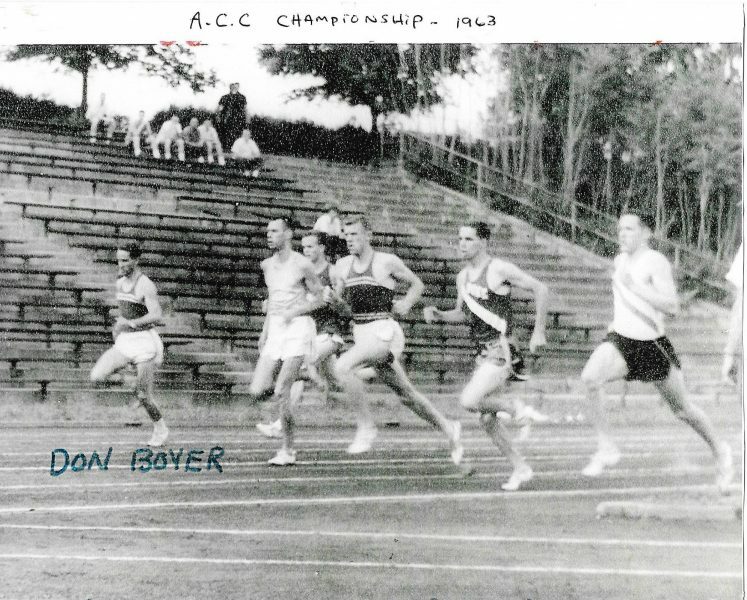 He placed third in the 800 meter at the Atlantic Coast Conference meet in 1963 and was part of Maryland’s conference champion 4 x 800 meter relay team. Beginning in 1953, the Terrapins captured the ACC team outdoor team title 16 consecutive years. As a coach at Middletown High School, he was only slightly less successful. The Middletown Knight boys captured 17 Maryland State Team titles under his guidance; including nine in Outdoor Track, two in Indoor track, and six in Cross Country. 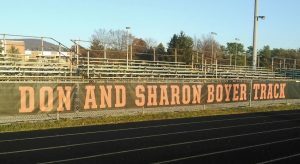 Don Boyer began as a head coach in 1966 at the newly opened Governor Thomas Johnson High School. He remained for a year and a half before transferring over to Middletown High School where he remained until 2015. Regarding his fifty-year high school coaching career, Boyer observed, “I wouldn’t do anything different. We did something very positive in working with young people, becoming part of their families. We were lucky. We had tremendous numbers and a lot of good kids in Middletown.” One Boyer-led Middletown Boys cross country team had a roster of 62. Today, at age 74 and legally blind, he continues to compete for the TNT (Today Not Tomorrow) International Running Club, based out of Philadelphia. He runs the 100, 200 and 4 x 100 meter relay, targeting some of the nation’s largest and most prestigious meets such as the Penn Relays, the Millrose Games, and the US Masters National Championships. 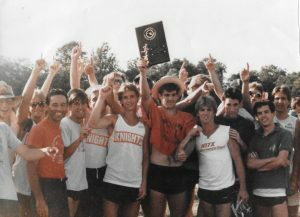 Other highlights include a cross country bike ride in 1991, meeting and corresponding with Dr. Roger Bannister, the first man to break 4:00 in the mile, and coaching his son and daughter to state championships. In a gracious mood, Don spent the majority of a two-hour interview praising various coaches, mentors, and athletes, starting with his high school coach Hal Moser and his college coach, the legendary Jim Kehoe. He credited Jack Griffin for getting him involved in an international track exchange called Pangea and with the U.S. Deaf Olympic Team. Coaching with the latter organization would take Boyer to Australia, New Zealand, Bulgaria, Italy, and Denmark. 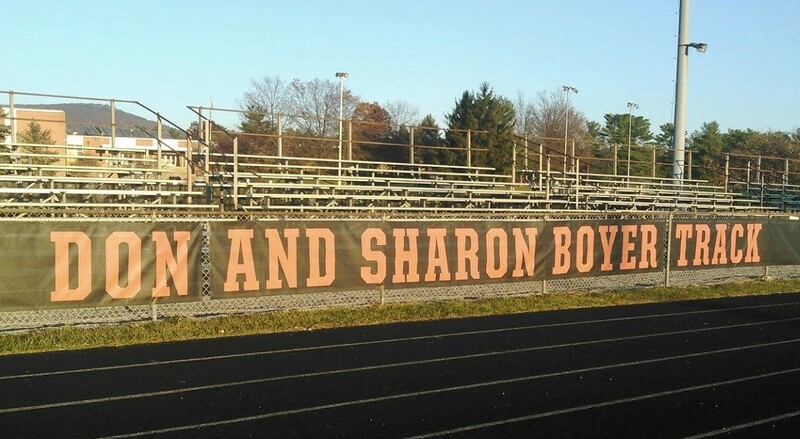 Sign at the Middletown High School Track Honoring Don and Sharon Boyer. Photo by author.